Him iz a bit prikklolee! guud moarnungyo anni and congrats on leeding teh way! Doan’t wurree! Ai aer dislesksik! Ai kan yooshullee sort fings owt tho! Thx fur teh congrats – we hab a tye! PB muss be habbin pyooter prollems agane – oar haz gon fur a biek ried wile it is nawt 2 hawt! Tawk uv teh …um…fello! Him postid saem tiem az me! * note to Prysma* This is in ‘Echidna pictures’ in Googlol. you nose wildlife is not so wild akshulleh when they start making doh queue men trees bout demselbs!!! Eddie Echidna’s home movies nd lolliday snaps ?? ohai nenne and pb! you saef and naet too hot in straylya, pb? you had a guud thyme riding teh horse, nenne? Haz a gud werk day, tuu !! Ai bet PoussinBoi woodn be too chikkin. Stikk to teh bicyclol then, PB. Weddings can be prickly occasions when peeplol get nervuss !! 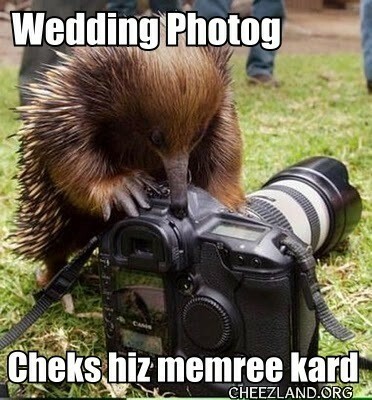 Teh fotograffer hoo tuk mai weddin pics wuz raver prikklolee! Nervuss fotograffer haz ants in hims pants !! No wunder him iz nervuss!! Teh ants shood be in himz lunchbox!! to teh happy engaged cupplol. It’z prolly tuu early faw a native ov callyforny tu bee owt ob bed nd lolling in cheezland .. ime shoor heel catchup later, tho !! Thanks! *bounces up in down in pouch* I think.